Lingering in a thought about you makes me pause and wonder what you would be like now. Would you have gone to college? Would you have gotten married? So so many questions that come to my mind when I linger in thoughts of you. Lingering at a photo of you – can’t quite do that yet. It’s been six years since you left this earth and to still look at your picture is quite painful. Even thinking about it now brings a stinging tear to my eyes. You were so lovely. So beautiful. And I loved you beyond measure – as a mother should. You brought life and lite into my life and I am a better person because of it. I’m a better nurse because of you. I’m a better mentor because of you. I’m a better writer because of you. And this I know for sure, God gave you to me to make me a better person. I’m so glad it took almost 18 years for it to work, but as I linger about you in thought, I wished it could have taken a little longer. Saying goodbye wasn’t an option. I just simply said “do your homework”. Brittany I have figured it out. I’m here for a purpose and I’m fighting the battle like a true warrior. I’m standing in the truth that God is good and he blessed me with you. And he continues to bless me each day by opening my eyes to what I can achieve. But my sweet baby – it was you that made me who I am today. As I sit here lingering, with a tear dripping on the keyboard, I feeling nothing but love and peace. Today’s message from Andy Stanley is part of a series called “When God?” I find these messages always seem to come this time of year when I am in reflection and need a reminder of although it might appear God isn’t answering me, or listening to me, He is giving me something you cannot buy or wish and that is GRACE. http://www.buckheadchurch.org/messages – link to get to the messages if you are interested. A very special song from Laura Story – Blessings that touched my heart. It is my wish for each one of you who follow my blog and find yourself wondering “When God?” – this song is for you and the messages from Andy Stanley may be just what you need to hear. Taken from my seat on my flight. Today as I was flying home from Tampa, I reflected on my trip and how amazing and fun it was to be in such a wonderful place like St. Pete. I’m thankful for the opportunity to get a little rest and relaxation as well as some time with family and friends. 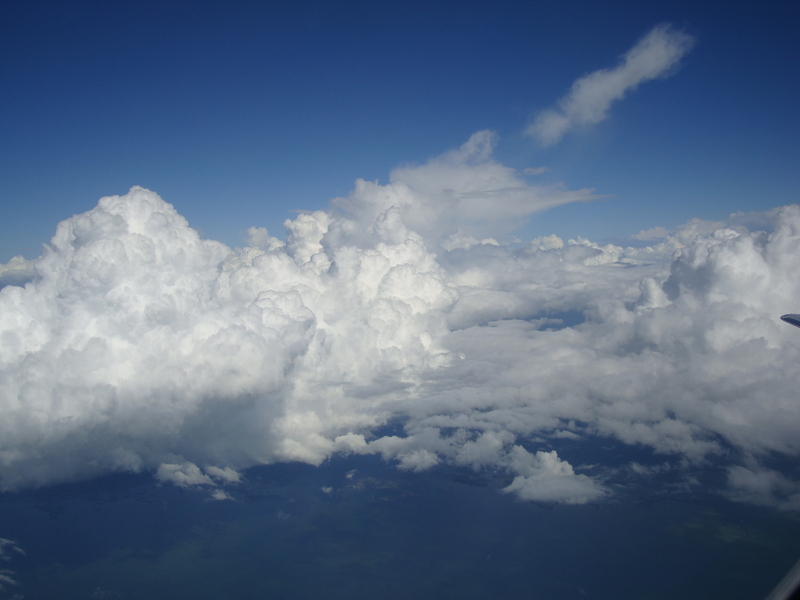 During the flight I was staring out into the sky and as has happened so often during a flight, I become so awestruck of the fact that God has been so gracious to me over my life. I know that may sound odd given the fact that I have lost so much and suffered so much, that I can still see God’s gift of grace upon my life. But I can tell you as I looked out at the beautiful clouds that surround the plane, I realized that God creates such beauty for us to enjoy. Yet we move so quickly through life that we forget to stop and look up. The clouds and sky look so different from up high. You know the clouds look like puff balls floating about the blue sky. I mean how can you not see God in that? How can you not see God all around when you are up so high in the sky. I always feel so close to God and Brittany when I fly. I feel as if I am just within a fine space between them and me. It’s such a peaceful time. I took some pictures of the beautiful cloud formations and in doing so, caught a quick glimpse of a rainbow. It made me smile. It made me stop and think just how small I am in a huge universe build by God, yet I too was built and wonderfully made by God. Sometimes we just need to slow down and stop and look around us and remember that we are living in a space that has been given to us to care for and to enjoy. So as you go about your day, busy working, going to school, taking care of your family – stop and look up and see the wonders and beauty of the world around us. It’s a gift. It’s a blessing. Well – I’m feeling better. It’s been a long week of flu symptoms and it took a lot out of me, but I’m getting my groove back and hoping to enjoy a fabulous Saturday of warmer weather. Today I had one of those unexpected blessings I talk about from time to time. As some of you know I have a Facebook account and have met some great people as well as reconnected with friends that I haven’t seen or talked in years. Today I got a chance to use Skype for the first time. I was able to talk with a dear friend I’ve only met via FB because of my church. It was 11:00pm there and we were chatting on FB when I asked if she had Skype and she said YES and I said I’d never tried it – so we did and we talked on-line via video for over an hour. Incredible. What a blessing this can be for so many other who miss their friends and family who live far away.